With war waging in Europe and coal being rationed, Governor Capper initiates a probe of the coal operating companies books. "The people must have coal and they are going to have it as long as it is in the ground and can be mined". 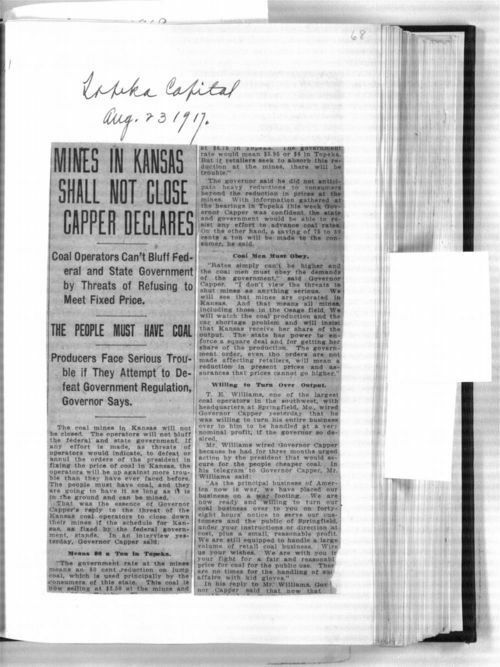 That was the essence of Governor Capper's statement to reporters on August 23, 1917. Price negotiations had been made in some parts of the country but the governor argues that prices had not been negotiated for states west of the Mississippi and the public is being charged the highest prices while coal companies profit.